The STS-128 crew have completed Flight Day 2’s activities, which focused on the opening inspections of Discovery’s Thermal Protection System (TPS), along with the checkouts of the orbiter’s docking systems ahead of Sunday night’s arrival at the International Space Station (ISS). Discovery launched Friday night on what is initially being described as a very clean ascent. Shortly after reaching orbit on Friday, Discovery’s Payload Bay Doors were opened, followed by the deployment of her Ku-band antenna. Discovery’s Remote Manipulator System (RMS) was also activated ahead of Flight Day 2’s inspections. Flight Day 2 opened with the unberthing of the Orbiter Boom Sensor System (OBSS) via the RMS, in order to carry out surveys of Discovery’s wing and nose cap, before heading to the OMS Pods to check for any tile damage or protruding blankets. Although Flight Day 3’s RPM (Rbar Pitch Maneuver) – carried out “underneath” the ISS ahead of docking – will provide a near-complete overview of Discovery’s heatshield, the OBSS inspections will give the opening insights into the extent of any damage sustained during the ride uphill. Back on the ground, the Damage Assessment Team (DAT) have begun their evaluations into the ascent of Discovery, a ride uphill that has initially been described as uneventful from a debris standpoint. The key focus will be on the External Tank (ET-132), following the foam liberation events during STS-127’s ride to orbit with ET-131. Following pull tests and hours of evaluations into the health of several areas – mainly the intertank and LO2 IFRs (Ice Frost Ramps), engineers are hoping to see less liberations via Discovery’s flight. Based on the initial data, no “major” foam loss events have been observed – though none of the recent flights can be classed as suffering from anything more than minor foam loss. A lot of work is required to study each element of camera, radar and onboard camera footage, usually taking several days to collate. Additional photography of the LO2 IFRs will have been gained for engineers on the ground, thanks to the debut use of a Modified Post-ET Separation +X maneuver on STS-128. 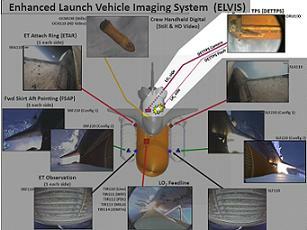 “Based on imagery observations of ET foam loss on STS-127, the imagery team was asked to evaluate possibilities for improving the Digital ET TPS umbilical still image photography of the ET LO2 tank,” noted a Program Requirements Control Board (PRCB) presentation on L2. “In theory, getting the camera over the LO2 tank sooner would allow less time for the tank to fall away, and thus improve camera resolution – especially applicable for dark (no sunlight) conditions because of the limited effective range of the DETTPS flash unit. 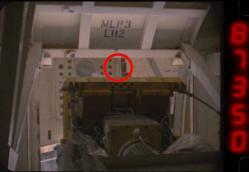 As noted in documentation and intimated by Mission Management Team (MMT) chair Mike Moses, a camera may be placed facing out through the pilot’s window on STS-129, in order to take video of how the LO2 IFRs behave during ascent, though a final decision is yet to be taken. Based on initial launch data, engineers know they will have to check what happened to a small area of ice that built up on the T-O umbilical on the Tail Service Mask (TSM) – though it is likely it fell off the vehicle during the very early stages of ascent from the pad. Debris, or more specifically, ice on the T-0 plate was also at the center of recent SE&I Flight Readiness Review (FRR) presentations, with the department calling for a Tiger Team – the name for the high level investigation team – to look into the liberation threat from the T-0 umbilical hardware over the coming launches. Ice on the T-0 umbilical hardware is not uncommon, but following the observation of ice liberating from Endeavour during STS-126’s ascent, and ice spotted on the plate as STS-125/Atlantis left the pad, a greater understanding was called for on the remaining shuttle flights, as part of the Shuttle Program’s ongoing threat mitigation process. 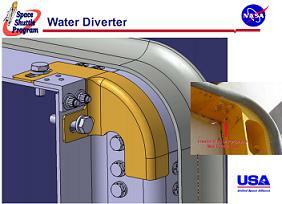 Ahead of STS-119’s launch with Discovery, United Space Alliance (USA) engineers worked on a ‘rain/water diverter’ modification, which was added to the TSMs as a form of extra protection from one of the determined drivers of ice formation on the T-0 umbilical area. However, ice outside of the mated plate may give indications of a potential threat, with SE&I working on ‘allowable’ mass observations, which in turn will be fed back to the Mission Management Team and Launch Director for what is called a ‘Day-Of-Launch (DOL)’ decision – as was the case ahead of STS-128’s launch. Full reviews of the DAT findings will be included in upcoming articles next week.